These businesses are helping couples get pregnant with an array of 'conceptionmoon' offerings. Sea moss elixir doesn't sound romantic. Neither do endless bowls of pumpkin soup, even when the setting for their consumption is white sand beaches and color-saturated sunsets. But the marine plant potion and beta carotene-packed soup are two of the reasons couples are heading to the Westin Grand Bahama Island Our Lucaya Resort for romantic getaways. Aside from relaxation, these holidays are meant to have an end result--a baby. The Westin Grand Bahama Island, which offers the "Procreation Vacation," is one of a growing number of hotels hoping to lure potential moms- and dads-to-be with promises of luxurious, relaxing and purposeful time to work on procreation. Nicknamed "conceptionmoons," these hotel mini-breaks follow on the heels of the well-established honeymoon and the more recent babymoon, which is aimed at cultivating some last-chance romance for couples who are expecting. Whether you own a bed and breakfast or a company that makes artisinal chocolates or lingerie, this may be a chance to expand your market. Many of the packages combine traditional aspects of romantic getaways with aphrodisiac, conception aids. Sea moss elixir and pumpkin soup are fertility boosters common to the island's native population. Bill Thompson, a Starwood Hotels marketing executive for several Westin properties, says he's tasted both. "The pumpkin soup is very good," Thompson says. "Can't say as much for the sea moss." The vacations are a marketer's dream, with an estimated 3 million women in the U.S. trying to conceive each year, but the concept is also based on sound research. There's an increasing consensus among doctors and researchers that stress can pose a major impediment to fertility. Victoria Koos, owner of Yin and Tonic Acupuncture in New York City and a fertility expert for RealSavvyMoms.com, says the vacations can help couples for whom stress is a key obstacle and even aid those facing truly functional fertility problems. Women can feel particularly alone during the pre-conception process, and a fertility vacation can help reunite the couple, says Koos, who performs acupuncture on women undergoing in vitro fertilization. "Part of the things I think I'm doing is reducing stress throughout the cycle," she says. A baby was behind the conception vacation package at the Five Gables Inn & Spa in St. Michaels, Maryland. The owner's son and daughter-in-law had success on a conceptionmoon at another hotel and came back with suggestions. "The 'Birds and Bees' package is trendy," hotel manager Marianne Lesher says. Couples who purchase the package get a couple's massage, a certificate for wine and oysters at a local restaurant, a pair of heart-dotted boxers, and two nights in one of the hotel's suites, which have whirlpools and showers large enough for two. 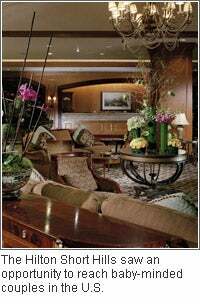 The package ranges from $810 to $1,110 per couple, based on the reservation date and room. The aphrodisiac-packed holiday is ringing true with couples. More than three-quarters of the members surveyed at parenting site BabyCenter.com reported taking a conceptionmoon while trying to get pregnant for reasons such as relaxation, rejuvenation and romance rekindling. Cost and privacy were key considerations for the couples, along with ovulation cycle. Many said they used ovulation predictors like those made by the survey's co-sponsor, Clearblue Easy. The prospect of planning for something as intimate as conceiving--and letting a hotel's staff in on the plan--may be too much for some. The Five Gables keeps a light touch and sense of humor about it, including playing Barry White tunes on the stereo, but Lesher says she suspects some customers are too embarrassed to sign up for the conception package and may instead opt for the hotel's "Romantic Package." 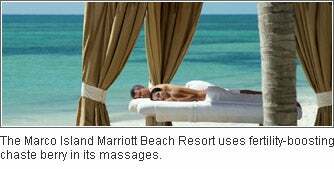 The Marco Island Marriott Beach Resort in Marco Island, Florida, offers the similarly silly-sounding "Fertile Turtle" package, which includes a room with gulf views, a king-size bed and a private balcony. The hotel also keeps guests supplied with fertility-enhancing red clover and raspberry teas, and incorporates a massage with chaste berry, which is purported to help stimulate the pituitary gland and boost fertility. Rates for the package range from $399 to $799 with a two-night minimum. One-night procreation vacation packages were launched just a few months ago at The Hilton Short Hills in Short Hills, New Jersey, says Edie Turna, director of sales and marketing. Turna noticed that a number of hotels in the Caribbean were offering the packages, and she saw an opportunity to reach local couples, including Manhattanites just 23 miles away. "One of the most stressful things in travel is just getting through the airport," Turna says. A similar vacation closer to home would mean less wear and tear on couples' bodies, and would increase their ability to enjoy their time together, she says. The Hilton Short Hills offers the "Blissful in Bed" package--$209 per couple--which boosts bedtime with unlimited movie rentals, late checkout and a candlelit bath. The more popular "Naughty Nights" package--$589 per couple--adds a one-hour, in-room massage, and room service of Champagne and oysters. Both packages include an array of Jane Jacobs bath products, which are also used at the hotel's spas but aren't complimentary with a regular hotel reservation. The products are made by New York-based June Jacobs Laboratories, which shares ownership and research space with the Peter Thomas Roth Clinical Skin Care. "It's a better product line, fairly exclusive, and it also has a very clean, citrusy-type aroma," Turna says. "It's great for couples ... and not overly feminine."